We believe that when you look good, you feel good. And when you feel good, you can't help but share goodness with the world around you. This motto doesn't ring truer than it does for purpletale's vision of their products and for those who use them. By using "wholesome, enriching ingredients that nourish your skin," purpletale has created an array of products that are simple to use and ones that "make it easy to feel beautiful from the inside out." Purpletale, a Korean skincare brand, is named by being a combination of two things: purple, not only just a color but also representing their participation in supporting causes that spread good and positivity in the world, and tale, which represents the importance of everybody's beauty story (and ultimately their happily ever after). I definitely do agree that when you feel good about yourself, your motivation and strive for success is a lot stronger compared to a mindset of feeling not good about yourself. Young-Ji, creator of purpletale, wanted to have products on the market to "help other people see the beauty in themselves" and use "effective ingredients for loving the skin you're in." Their own personal struggles with low self-esteem and feeling inadequate under the weight of society's perfectly constructed image of beauty motivated them to create purpletale. One of purpletale's main focuses is to empower others to discover, love, and celebrate who they are, and serve as a reminder that "the best thing you can be is yourself." It is not about getting help to become beautiful, rather it is about getting help to see the beauty that you already have. I was contacted by Young-Ji to try out some products a few weeks ago and I have very much enjoyed using every single one! I've not only been impressed with purpletale's products, but also with their positive message about self-acceptance and self-love. When a brand puts their customers' interests as their focus, let alone using quality products that actually work, then you know you've found a winner. I'm a daily user of FTE's (my HG being Missha FTE), so I was very excited about the prospect of trying this out! 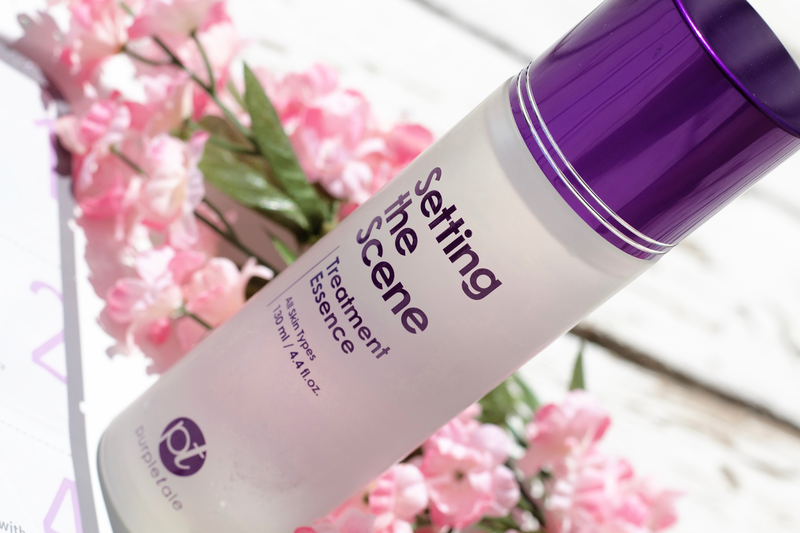 I firmly believe that essences are a really important step in the skincare routine, regardless of skin type. I have very oily-oily skin and I cannot be without having a FTE product in my routine. Not only is it a great prep for other skincare products, but it being one of the first steps after the cleansing routine means it's able to penetrate the skin without having any other products layered before it. Exceptions are for actives like your BHA/AHA/Vit C/etc, which are not an issue since they are used before all moisturizing products and need specific pH levels to be truly effective. Purpletale's FTE is a lightweight watery liquid that claims to hydrate and revive the skin, "leaving you glowing from the inside out," and specifically focusing on improving skin's texture and clarity. Anything with the words "glowing," "brighten," and "clarity" just instantly has my attention! It says that it's great for all skin types, which I assume it would be as this essence is a workhorse, and includes great ingredients like niacinamide (my favorite ingredient ever), ginseng (anti-aging/brightening), peptide complexes (anti-aging), and adenosine (natural in body occurring ingred., anti-inflammatory and cell-communicating). 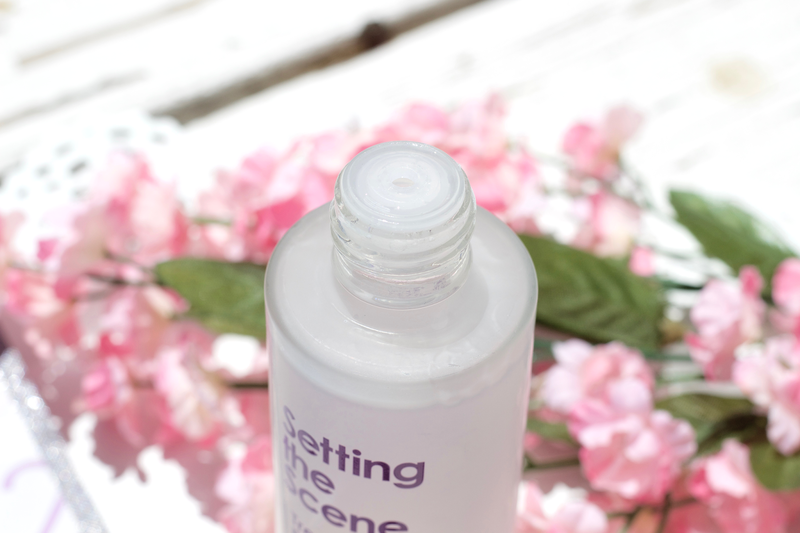 My first impression from opening up the cap of the bottle is that it has a medium strength fragrance, which you may take with a pinch of salt depending on how sensitive you are with fragrances in your skincare. I personally am not too bothered when it comes to stronger fragrances, whether they are added or naturally there, but it can be a bit of a 'wow' moment when you first smell it. I like the smell, it's a flowery scent that actually reminds me of Febreze, funny enough! Purpletale is also kind enough to supply an English translation directly onto the product packaging, which is great for those of us who don't read/speak any Korean. The opening of the glass rounded bottle releases just enough product so that you're not wasting any, and as it applies onto the face it spreads very easily. I did however have the sense that I could feel it on my skin, compared to Missha FTE that just sinks in right away, and I think it's possibly due to Dimethicone's large molecular size; this ingredient is a synthetic gel-like silicone base polymer, it is a non-absorbent 'carrier' to help other ingred. absorb better into the skin. A lot of skincare companies use this ingredient as a plumping effect, as it settles into the lines on your skin to smooth them, as well as advertising all sorts of amazing results. Dimethicone on its own is a problem, as it just acts as a filler and won't have very long lasting effects, but combined with an assortment of other ingredients (like in this product, niacinamide, etc) it works wonders. This is not a deal breaker for me because I think this product is great, but I think this should be pointed out as it's quite high up as an ingredient. Besides all this, it dried at an average amount of time and I felt instant hydration, and the next day I definitely could tell my face was more plump! The brightening effects were more visible with constant usage, as I used this consistently for the past weeks. Overall this product does what it claims, it acts as a great step to improve texture and nourish the skin, and I think this especially would work best the night before you have a big event or special occasion as it really adds such a lovely glow. First I want to say, the opening description of this cream is so cute! Good plot twist: Cinderella has no time to make her dress, but still makes it to the ball on time. Bad plot twist: Little Red Riding Hood goes to grandma’s house and finds a wolf instead. 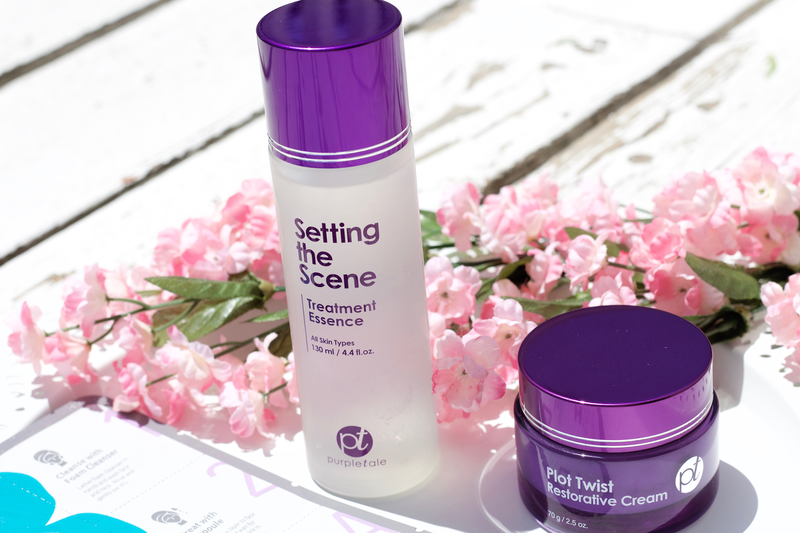 The worst plot twist: getting a blemish right before a big date. So as you can tell, this cream is all about restoring your skin back to it's natural and balanced state. I am someone who is daily plagued by troublesome skin, as you've all heard me talk about before, and even more so am concentrated about getting more anti-aging focused products into my routine. 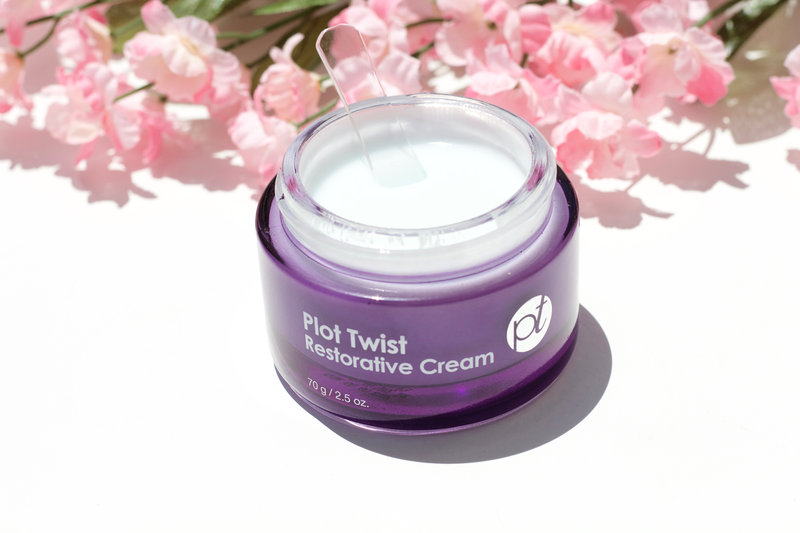 This thick, jelly-to-silky cream claims to restore and hydrate while you are off in dreamland, and I can definitely agree that it does exactly that. It is housed in a glass, purple jar (love the color scheme so much!) and comes with a little spatula to help with keeping things sanitary, which I personally really appreciate. The presentation of this cream has such a luxurious feel to it, especially as it is quite heavy (in comparison, much more than Sunday Riley's Tidal). You really only need the smallest of amounts to scoop out of the jar to cover your whole face, and I'm making this a warning to those who have combo-oily skin. I say this because it is a heavy cream and you will feel it sit on your skin for a while due to numerous thickening agents, such as Cetyl Ethylhexanoate (emollient), Dimethicone (silicone), Methyl Gluceth-20 (humectant/emollient), PEG 100 Stearate (emollient), etc. I also want to point out that there a numerous ingredients in here that some may find not to be of their liking due to personal opinion/preference/skin type, such as parabens, preservatives/ex. Phenoxyethanol, PEGs, etc, so YMMV applies very much here. I usually am not a big fan of thick creams like this, if I'm completely honest. I have used ones like Estée Lauder's Revitalizing Supreme Global Anti-Aging Creme, which is like slapping huge amounts of cooling silicone all over your face, so I was prepared for the heavy texture. After it sets a bit, you get used to it and I found it didn't bother me much anymore. The next morning I woke up with such soft skin! It was expected of course with all the nourishing and skin replenishing ingredients included, but I was impressed and glad that I did not give into any possible first negative judgements! The longer I continued to use it, I noticed that my skin really just kept that softness and I would wake up looking so refreshed. This cream I can see being a 'use when you need' product, as its rich and thick consistency would be great for special treatments. On a daily basis it seems a bit too thick for me and right now in Southern California it's unbearable heat-wise, so I've been using light-weight creams/oils for my routines mostly. Once it starts cooling down, I will for sure be using this more! A fun part about it is that it keeps its shape after you pick up product; it reminds me a lot of Innisfree's anti-aging Orchid Intense Cream (they share a lot of the same thickening ingredients). Out of all the products, this one I reaaaaaally was looking forward to trying! I just think it's one of the most genius things to come up with, plus such a time saver and great for those who are often traveling. 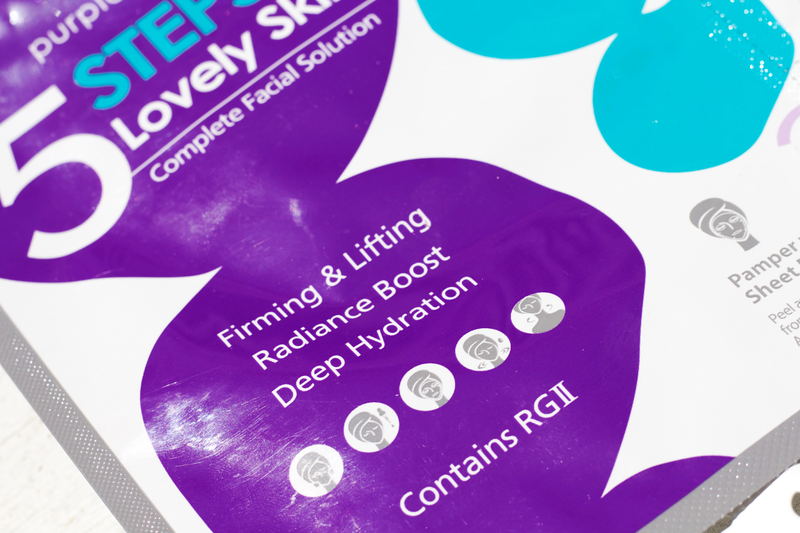 Purpletale describes it as a "complete facial solution that will leave your skin feeling deeply nourished and looking absolutely lovely," and I can really agree with that. It also claims that it will provide firming and lifting, a radiance boost, and deep hydration. Another thing I whole heartedly agree with, especially for the sheet mask and ampoule used together. Cleanse + Foam Cleanser: Lather foam cleanser in hands and wash face and neck. Rinse and gently pat dry. Treat with Ampoule: Apply a thin layer to face and neck and wait for the product to sink in. Pamper with Sheet Mask: take out the jelly textured sheet mask and gently separate the two sides from their protective films. Apply it onto face and leave on for at least 20 minutes. Moisturize with Facial Cream: Dab cream on face and gently apply moisturizer evenly. Nourish with Neck cream: Massage onto neck with an upward motion. 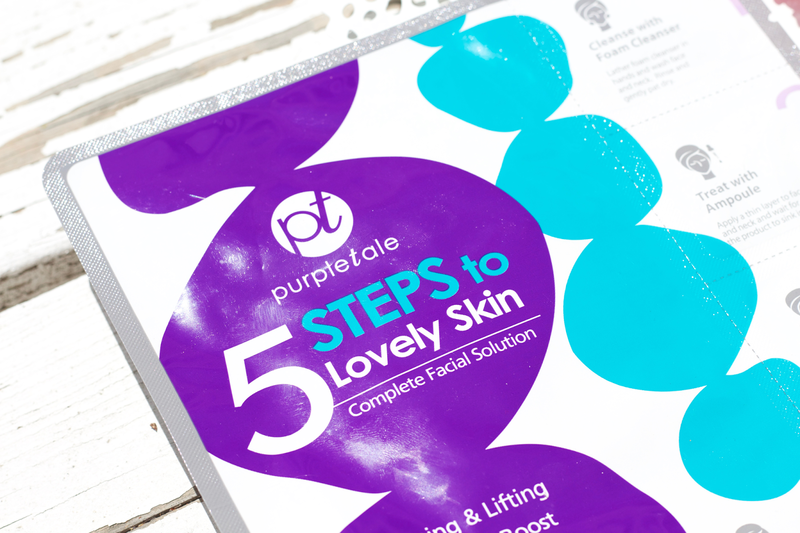 Seeing as there are only five steps, it really is meant to be such an "effective and convenient skincare solution," as purpletale calls it. Personally I found it to be not enough steps to cover everything that I need out of a skin routine, but for the mere basics and an introduction into purpletale products, I think this does a great job. Starting with the foam cleanser, it definitely must have a high pH because even with my skin type I felt like it dried out my skin a bit (not totally though). I don't really use foam cleansers that much besides my Omorovicza Cleansing Foam, which doesn't dry me out at all, but I do think those who have anything below combo skin might feel some possible extra dryness from using it (depending). The ampoule was really lovely to use, as I'm a big fan of using them, and I think in combination with the ingredients in the sheet mask the two really worked well together. Fun fact: the ampoule is also very interesting since it contains an ingredient called Polyglutamic acid (PGA), a water soluble amino acid polymer produced by Bacillus subtilis natto, which is an enzyme producing bacteria that is directly part of the soybean fermentation process of making natto (納豆). After the concentrated fermentation process, the Polyglutamic acid creates the very stringy and viscid substance that is iconic to natto. The reason why I mention this is because PGA contains some brilliant skin benefits, like brightening and evening out skin tone, locking in moisture, helping with appearance of fine lines, along with promoting smoothness and elasticity. Applying the ampoule onto the skin after cleansing gives it a great advantage to really get the most out of its ingredients, which then makes using the sheet mask an even better next step. 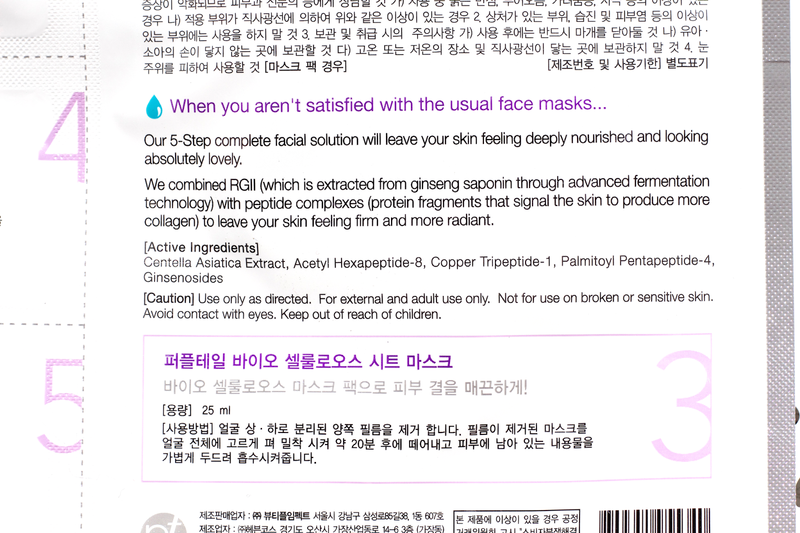 The sheet mask has some really great ones too, like RGII extracted from ginseng saponin, which gives great benefits for anti-aging, smoothness, and radiant skin. Centella Asiatica is also a great herb that used topically can help skin damage and scarring, and naturally can improve the moisture barrier and support of collagen. Purpletale was so smart to put the ampoule and sheet mask together like this, both of these two products work hand-in-hand together to help the skin get to its best possible state. I don't think that with one usage of this packet it would be enough to really see significant improvement, I think investing in numerous ones and using consistently would really show the best results. Following the 20 minutes of using the sheet mask, the next application was the facial cream and luckily was not as heavy as the Restorative Cream. It absorbed much quicker than the Restorative Cream and hydrated my skin really nicely, I felt quite comfortable having it on. The Neck Cream was interesting to use as I do apply cream onto my neck but not just straight onto it, usually I bring it down from my face and blend it in. However, this felt really so nice and it's important to take care of your neck area as much as any other parts. What I most appreciate is that purpletale's products are not sticky, and I find that is one major deal breaker for me when it comes to things is that if they are sticky, then I am just too put off by them to continue using. Young-ji has put a lot of heart, thought, and dedication into all of the products, and each one has its own specialty about them. Purpletale's mission--be good, look good, do good--really can be felt by using these products. Young-ji has created some lovely, nourishing and quality ingredient items that really deserve to be noticed. 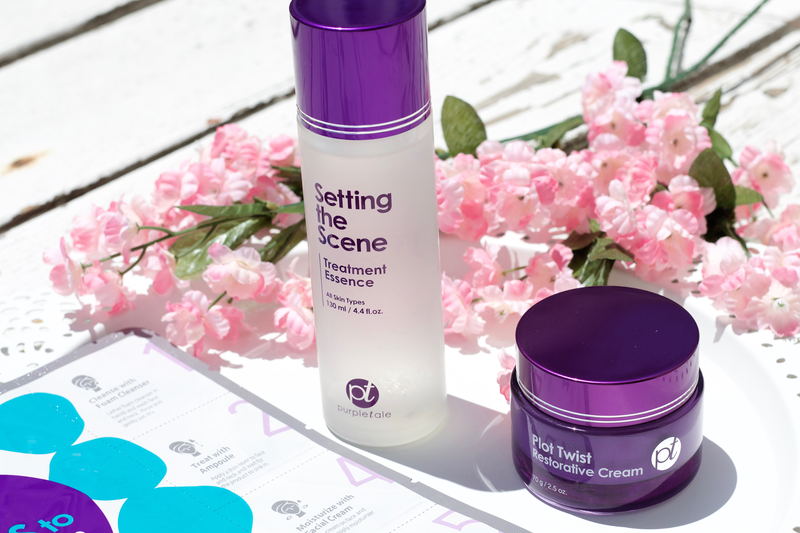 Whether one product is more towards your liking than the other, I really think purpletale is a skincare company to be supported as its values and core seek to do good. I definitely think the Treatment Essence and 5 Steps to Lovely Skin should be checked out by everybody. These two products will for sure give you results and provide your skin with the nutrients and moisturizing benefits that really everybody needs. I know that if I happen to run out of the essence I will for sure be buying it myself! Have you tried anything from purpletale? What is your favorite product?